I compared the Panasonic AG-DVX100 and Sony DCR-VX2000 cameras in interlaced and progresive modes on the same scene, using each camera's "default" in-camera sharpening setting for each case (center or 0 position). The full scene is shown above (resized to 40%) and detail crops near the center palm tree are shown below from each camera at 200% size so you can see the details more easily. 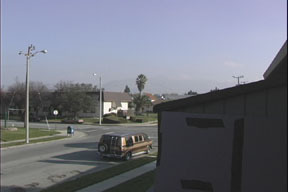 The sky is a flat, hazy blue in this shot. The most obvious difference is in the degree of in-camera sharpening between cameras and between modes, although in each case the camera is set to its default position. The DVX100 in progressive mode was set to "fine" detail. It is most noticible in the roof of the house and the near-horizontal powerlines, but the difference is subtle. On the DVX the lower detail in interlaced mode is visually compensated by the stronger sharpening effect, and notice also the light halos edging the darker palm tree leaves. The DVX noise appears greater in interlaced mode, contrary to expectation, which I believe is due to the stronger relative sharpening. In practice the VX2k is almost always used in interlaced mode, due to its progressive-scan mode recording only 15 unique frames per second. 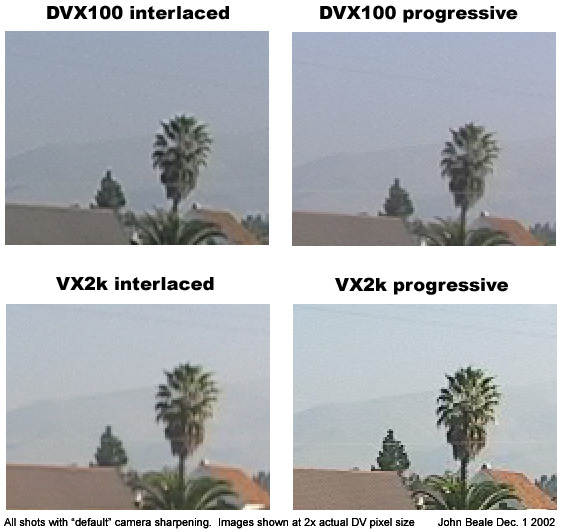 You can use VX2k progressive mode for stills, and as you can see the default progressive mode uses a very strong sharpening filter in the camera. To my eye the DVX stills show more noise on the sky than the VX2k in either mode. Depending what area you sample however, the Photoshop histogram tool shows the noise levels very nearly equal, or with the DVX lower in noise, I don't know why this is. The noise is not as apparent while viewing motion video as it is in still frames: I do not notice any noise when viewing the motion video on either a 13" monitor or a 27" TV. For one thing the eye tends to average low-contrast detail over several frames, and also my Panasonic CT-27SF36A television seems to have some built-in filtering. "Temporal filtering" on your computer NLE can accomplish this as well, and is recommended for best compression efficiency before encoding MPEG2 for a DVD.